Are you looking for a last minute idea for Father’s Day? Well I have just the thing for you! Last year, I had ordered my husband the football jersey that he had been bugging me to get him FOR MONTHS, and it was supposed to arrive the Thursday before Father’s Day. I had it shipped to work, so that Mr. Nosey wouldn’t see what it was. If he’d seen the package from NFL.com, he would’ve known right away what it was. I was working from home that Friday so we could leave right after work to go out of town to visit my family for the weekend, so I was anxious for it to arrive on Thursday. But it didn’t. Sure enough, it arrived on Friday, to work, while I was at home. Of course. For those of you that don’t know, I do not live close to work, at all. So it’s not like I could just drive on over real quick and pick it up. So my poor husband would not have his present to open on his first Father’s Day. To top it off, I’d bought him a really sweet card, and hidden it in the room, again so Mr. Nosey wouldn’t see it, but about 30 minutes into our road trip, I realized it was still hidden in the bedroom!! Well, I had to tell him what happened, and to this he said, “Great, the best first Father’s Day ever!”. Mind you, he was joking around, but I’m sure he was disappointed, and I don’t blame him. 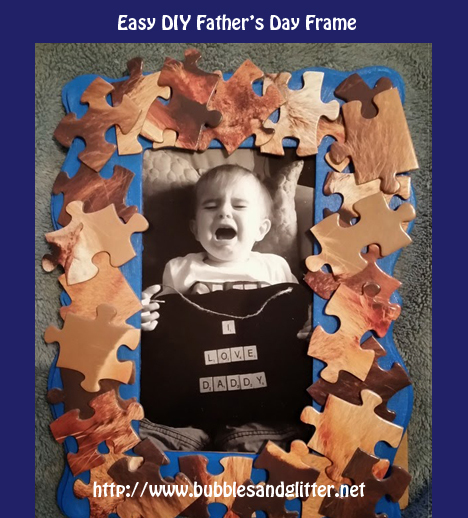 For our craft, we decided to make a picture frame, with puzzle pieces around it, with a picture of little G holding up a sign that says “I love Daddy” with Scrabble letters. First I painted the frame because I wanted to give it time to dry. I painted it blue. 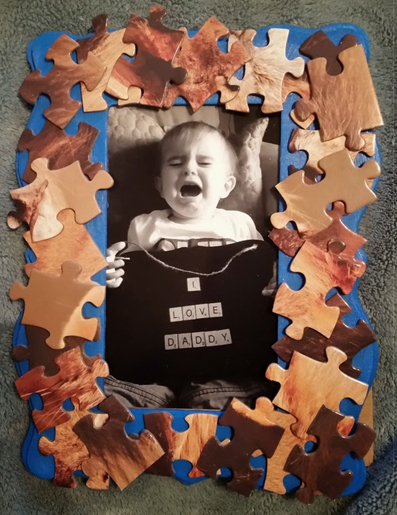 Once it dried, little sister hot glued the puzzle pieces to the frame. She is the artiste so I let her arrange them for me. We used a lion puzzle, because we thought the colors would make the blue pop more, which they did, and because Little G’s room is Lion King themed. Little sister then taped the scrabble letters to the chalkboard sign, because it had to be perfect and centered just right. She’s a little bit OCD. Maybe a lot…Then came the fun part, taking pictures. Within about 2 seconds of handing Little G the sign, he started peeling off the letters and immediately put them in his mouth. Choking hazard, anyone?? We took them away, he got mad, we stuck them back on, gave him the sign back, and would repeat, while little sister was trying to snap as many pictures as possible at the same time. We went back and forth like this over and over again. We tried different locations in her apartment, tried standing, sitting, squatting, etc. She used the rapid fire feature to just keep taking pictures to try to get at least one good one. She also has a very needy Jack Russell, so the whole time, all he wanted to do was play ball, and kept getting in our shots trying to get our attention. So in between shooting pictures, she would have to grab the ball and throw it as far as she could across the room to try to buy us a little time. We got a few decent pictures of him smiling, but we (she) decided this one was the best. I have to say, I am really happy with how it turned out, and hubby loved it! Anyone else have any easy DIY Father’s Day gift ideas?? Don’t forget to visit the Link Ups page to see where this post is being shared! Don’t forget to check out the other posts on the link parties too!